In 1974, a psychologist called (Dennis Upper) tried to write down a scientific paper. He was looking for some ideas for quite a time, some hour, 3 days, a whole week he spent with no ideas coming to his mind. Exactly as you can see, Dennis Upper came up with a completely empty scientific paper with empty references too. The paper was titles (The unsuccessful self-treatment of a case of "writer's block"). He sent it to (Journal of Applied Behavior Analysis) for review as it is not knowing what to do but he felt obliged to publish it anyway. The editors of the journal thought he was kidding but when they considered a second thought about it they figured out that even this empty scientific paper could hold some hidden value. The paper got admired, published, and even cited for 65 times till now. It caused a massive buzz inside the scientific community about the importance of "Writer's Block" as a psychological crisis that could affect many writers and authors at any point of their professional career to leave them helpless. The paper also helped to encourage people to proceed with writing anyway even if they have nothing to say, it inspired many authors to face fear and not to feel ashamed of not having something to say. 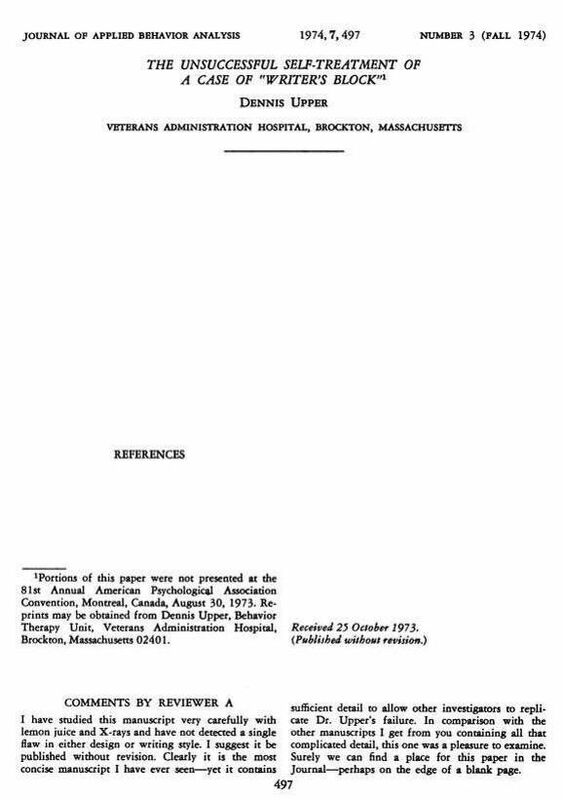 (The unsuccessful self-treatment of a case of "writer's block") is considered widely the shortest and maybe the most famous scientific paper ever. If you ever suffer a writer's block, remember what Dennis Upper did and feel the courage and bravery to do something about it and sometimes silence speaks more words than big textures.